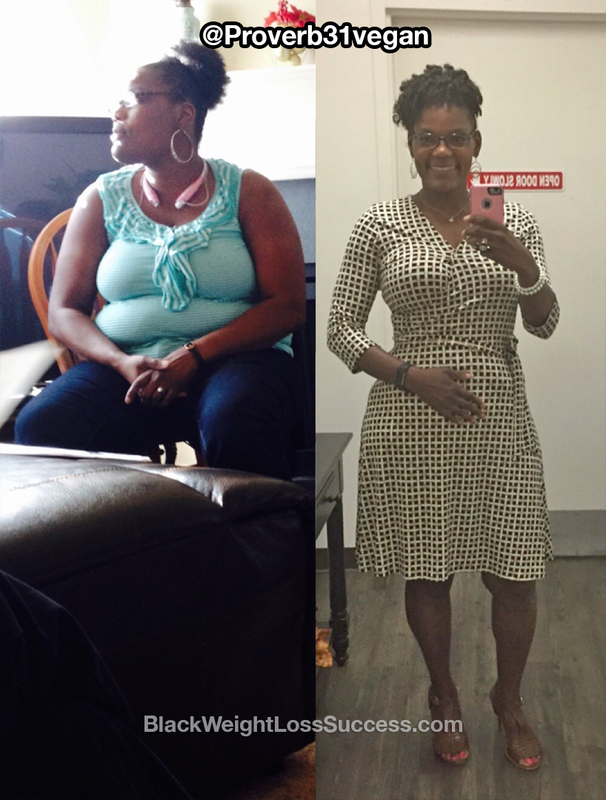 Transformation of the Day: Shasta lost 66 pounds and she gives the glory to God. For years, she allowed other people to dictate how she felt about herself. After much prayer and seeking wisdom, she came to know just how wonderfully made she is. She also learned how to use food and fitness to create a healthier life. Check out what she shared with us. At first, I wasn’t going to submit my story because of the reactions I thought I might get. The picture of me at my heaviest serves as a constant reminder of how toxic my life had become, from friendships, to relationships. Mentally, physically and spiritually, I allowed people to dictate how I felt about myself. I was also an emotional eater, using eating to hide the pain. I was the one who put myself down before others could do it. I’ve had more nights crying about my weight and how I look than one could imagine. I’ve spent sleepless nights wondering if I was going to have a heart attack and had constant panic attacks. After much prayer and seeking God, I have learned that I am “beautiful and fearfully and wonderfully made in the image of Christ”. I also took the time to learn which foods I can eat and how they make me feel inside. With that knowledge came the responsibility of taking care of myself in a healthy way. 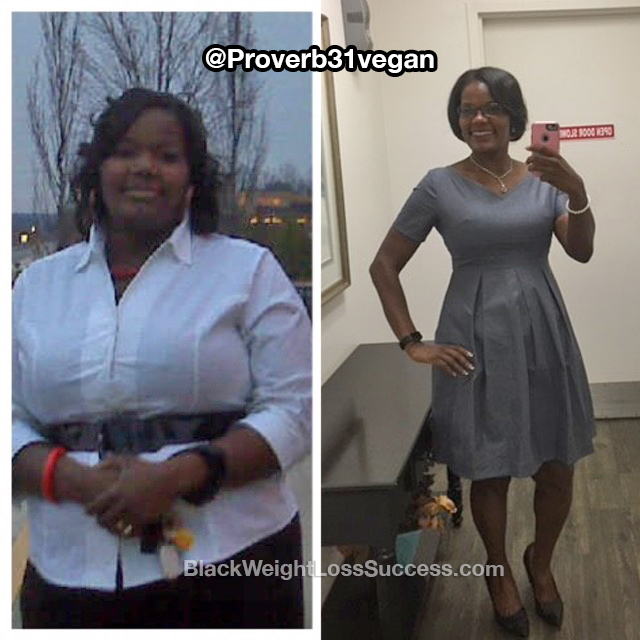 Initially, when I started my journey 2 years ago, I started as pescatarian. Just recently, I became vegan (by consumption). I didn’t follow a specific program. I research foods, read food labels and stay away from sugar. For exercise, I typically workout 4 days a week, doing cardio and weight training. I love Zumba, step aerobics and spin classes as well. At my heaviest, I weighed 253 pounds. My current weight is 187 pounds and I stand at 5’7″. 66 pounds down! My goal weight is 175 pounds. My ultimate goal was to just be healthy. I knew that by eating right and working out, the weight loss would be just one of benefits of me becoming healthy in general. This road hasn’t been easy. I’ve given up at times, only to realize that my life was worth the hard work. Then, I jump back in head first. These results were not from any quick weight loss fad. This is truly a result of hard work and dedication. If I can do it, so can you! I owe all glory to God for transforming me from the inside out. I’m not where I want to be, but I’m making strides to get there. My motto is “One day at a time, one meal at a time” and that’s the only advice I have. Understand that you may mess up and have a horrible breakfast, but don’t count the whole day as a loss. Get right back on track for lunch. Lastly, I want to encourage you to get you some accountability partners. Look for someone who has reached their goal. Look for someone who won’t judge you, but will call you out on your foolishness. You will appreciate that support later. GLORY TO GOD! Sis you look AMAZING!! You told my story!! I felt the same way, I let people dictate how I felt about Me! Then GOD began to show me the woman he created me to be, and now I am working towards a better me. Thank you for sharing, it has Blessed US!! Stay Encouraged! Thank you so much for sharing your story. You truly have inspired me and I would live to have you as an accountability partner.